Wouldn’t it be simply amazing if you could bring the gym home instead of unwillingly dragging your body to the gym? That way you will not have to follow specific timings and can workout at your own pace. Well, now you can bring the perfect workout machine home with the ProForm Power 995. Ergonomically designed, it has 2 ProShox Elite cushioning, EasyLift folding mechanism, quick speed and incline controls, music compatibility port for iPod, iFit Live, speed and incline limit up to 12mph and 15% respectively, coupled with a powerful 3.0 CDH motor and 20 in-built workout applications. Apart from these first rate features, it is durable, robust and extremely smooth to use. Whether you wish to do intense workouts or simply remain fit, this is the ideal choice. Moreover, if you haven’t started working out yet then you have the perfect excuse to do so in the ProForm Power 995. For a treadmill loaded with so many features it does not make whiny noises at all. The Power 995 is perfectly smooth and does not make any sort of unpleasant or disturbing noises at all. Even if you constantly change your speed and incline levels, the transitions are pretty quiet. It measure 34 x 70 x 60 inches implying that you obviously do need a dedicated space for it. However, the deck can be easily folded when not in use or if you are planning not to use it for a couple of days. This is facilitated with the EasyLift mechanism, which pulls the deck towards the screen without you having to put in any effort. This is a complete space saver. This 995 model from ProForm is the perfect combination of comfort and intense fitness. It is incorporated with 20 workout programs, which includes 10 weight loss and 10 performance programs, aiding the user in achieving the best desired results. Apart from this, it has a speed limit of 12mph and incline range up to 15% with one touch buttons for every level making it easier for the user to make transitions. The ProForm 995 has a Mach Z Commercial Plus 3.0 continuous duty horsepower motor making it extremely dynamic and all-powerful. This heavy motor gives it extra stability and durability along with making it effortless for the user. The initial assembly, although time consuming, is not really rocket science. It is quite easy to assemble especially when you follow the clear and detailed instructions given in the user manual. We recommend assembling with a friend or your partner, to save time and reduce the effort necessary. Additionally, using this treadmill from the word go, is darn easy. Moreover, the control buttons assist in setting a desired speed and incline level with just one touch of your finger. The deck measures 34 x 70 x 60 inches and the running surface measures 20 x 60 inches. The tread belt is quite long and is resistant to skidding hence you can use it for brisk walking or jogging without having to worry about slipping. In addition to the strong grip of the surface, the belt is supported by 2 ProShox Elite cushioning, which act as great shock absorbers and help in reducing the impact on the knees and other joints preventing any kind of joint pains. In the end we strongly believe that the tread belt of the Power 995 assures a comfortable and unproblematic fitness regime even for folks with unnatural pronation. It can be hard to believe that a treadmill can actually have so many features without compromising on the quality. The ProForm 995 has in addition to its regular features certain extras, which make it even better. It has an iPod music port which can also be used to connect your laptop or any other mobile device, allowing you to enjoy music while exercising. Also, being compatible with iFit Live technology gives you the chance to experience wirelessly downloaded workout programs and training sessions. Furthermore, keeping a count of calories as well as heart rate is equally simple of a task. Foldable, quick control buttons, 3.0 CDH motor, iFit and iPod compatibility, cushioning for the surface belt, choice of 20 in-built programs, easy to assemble, durable. You have to spend extra for the iFit module, short hand rails. Overall, the ProForm Power 995 offers a lot more than any regular treadmill. 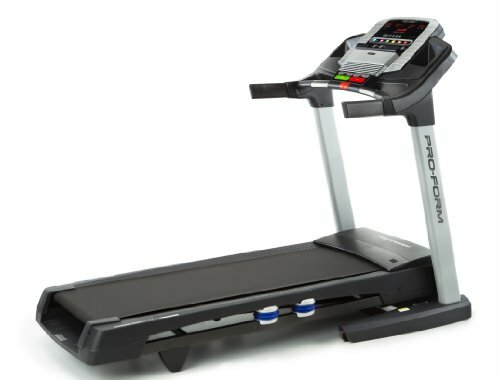 A high horsepower motor, user-friendly operations, perfectly cushioned and well-gripped running surface, space saver folding capacity, music port in addition to iFit compatibility, high levels of speed and incline and 20 inherent workout applications will make you realize that your decision of plunging your money in this treadmill was absolutely worth it. Heavy, solid and perfect in its functions, exercising will feel much more comfortable and easier than ever before.